It looks like a 32GB iPhone is on the way if a recent T-Mobile 'snafu' is to be believed. 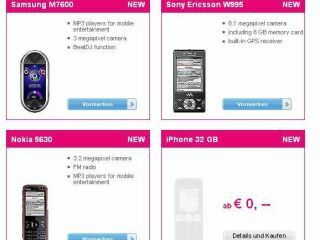 An iPhone 32GB placeholder image has appeared in the 'Coming Soon' section on T-Mobile's website in Austria. This could well be a slip up on T-Mobiles part of course, and we will have to wait till 8 June to find out exactly what Apple does have in store for the next gen iPhone. From the (poorly) Google-translated German-to-English site: "After many rumors from inside sources and Chinese website, there is now the first official reference to the new-generation iPhone 32 GB on the site…"
"Others reportedly have the new iPhone also has a 3.2-megapixel camera with autofocus and an illuminated logo on the rear panel. Apple is also an energy-saving AMOLED display include an up to 800 megahertz processor and a compass."